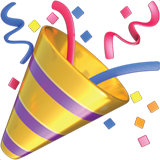 Those who were with us at SaaSFest 2016 last week probably understand how we feel right now. We're amped and inspired by the love of learning and the atmosphere of support in the SaaS community. We all left ready to take the knowledge we absorbed and put it to work in our own SaaS companies and for our customers. 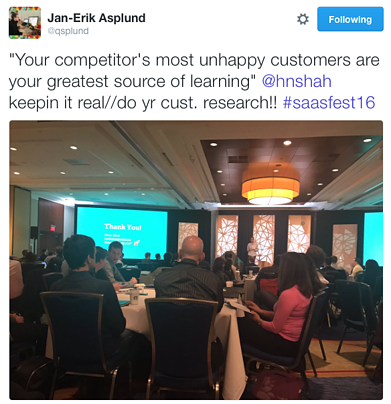 Focusing on customers was a huge theme of SaaSFest '16. Learning about and learning from customers was the main takeaway of the day. At Price Intelligently we like to think that C.R.E.A.M. stands for Cloud Rules Everything Around Me—and our speakers taught us that in 2016, C.R.E.A.M. also stands for Customers Rule Everything Around Me. Even if you couldn't make it this year—you're in luck! We've mined some of the most salient messages from our incredible SaaS speakers to share with you on our blog. We want to make sure everyone in our Price Intelligently community gets the most out of SaaSFest '16—and gets ready to sign up early for next year's event. 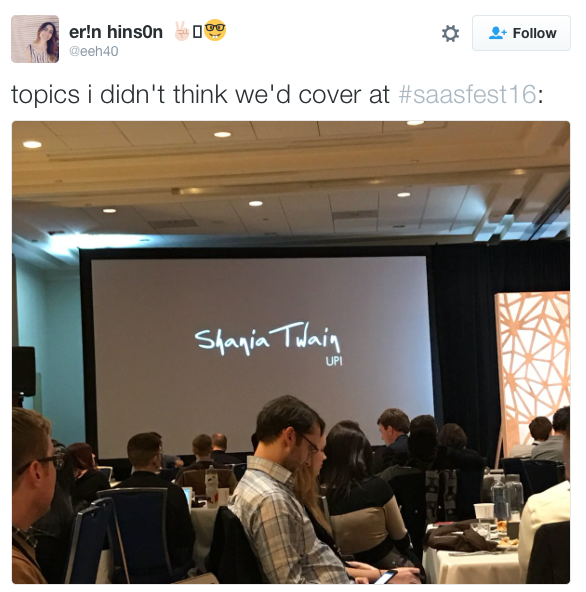 This SaaSFest was the biggest and best yet with 13 speakers representing the best and brightest in SaaS. Let's relive the top hits of the day and get amped—all over again—about how to build the best SaaS companies together and adopt a customer-first mentality. These are some of the brightest bits of knowledge from our SaaSFest '16 speakers, straight from their own SaaS experiences, mined just for you. We're bullish on value-based pricing. There's simply no better way to look out for both your company and your customers. The best way to create value-based pricing is to understand what your customer looks for and gains from your product. This means talk to your customers. As Patrick said, doubling down on your efforts to understand your customer doesn't cost anything and brings you enormous long-term gains. Patrick also dropped the truth on naysayers who don't think they have the time or money to implement a value-based pricing scale. He pointed out that spending just a couple thousand dollars on pricing research and realignment processes can save you around 18 months of development time. Make sure you're prioritizing correctly. According to Brian Balfour, Product/Market fit is evolving. When early companies become fixated on finding the right market for their product they overlook the big picture. Market, product, channels, and model actually all work together and depend upon one another. Using the language “Market/Product fit” will encourage companies to think about the market first and the product second. Instead of building a product and searching for a market, identify your market and then build the right product. Think about this early to cement the idea of your market, product, channels, and model as one coherent ecosystem that must work together for you to be successful. David Cancel believes we've moved past the first era of SaaS, which was driven by a company-first approach, to the current customer-driven era. The operational philosophy of the first era is doomed to become ineffective because it requires that companies look inward and treat customers like leads. 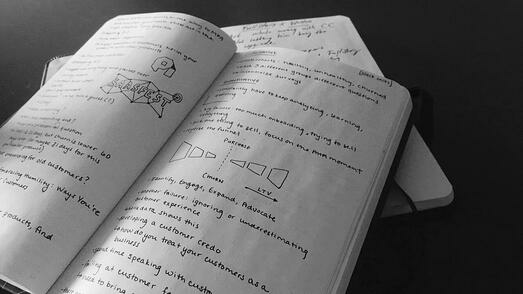 No customer—and no person—wants to be treated like a lead. Cancel pointed out that since most companies today are tech companies, you can't rely on your technology alone to distinguish your business. 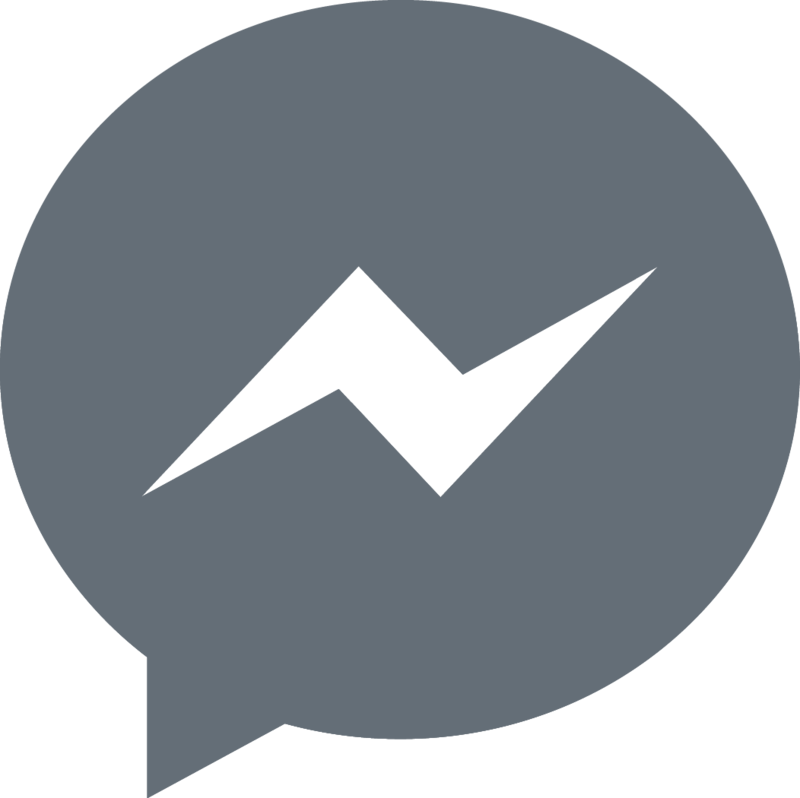 You have to distinguish yourself by your customer relationships. That's why David defined winning as owning the customer relationship. 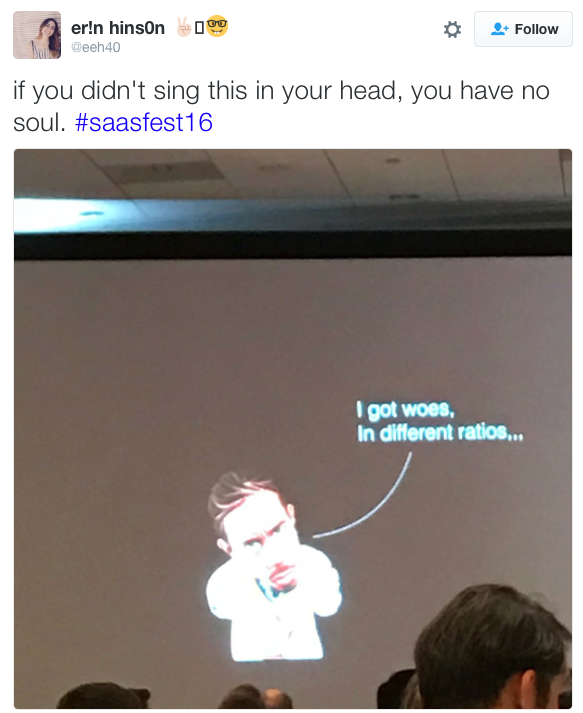 Many speakers at SaaSFest pointed out that competitors are much more of a force in SaaS today than they were a few years ago. It isn't just important to understand what your customers see in your product—it is essential to understand what they see in your competitors' products. Hiten explained that he learned about Google Analytics's shortcomings when he was building value into his own product. He showed that you can build a hugely successful and helpful product if you innovate by learning from what your competitors lack. Not every medium of communication can foster those all-important customer connections. Naike Romain explained how video is the ideal medium for connecting with your customers because it allows you to convert, to teach, and to evoke emotion. Think about your customers on a human level—you'll realize that they make emotion-driven decisions just like you do. People want to connect and to feel. If you show that you understand the emotion that drives the why of their purchase, you'll build a stronger brand and develop loyal customers. Growth for growth's sake is meaningless. Without substance behind your growth mission, you'll soon find yourself attempting “growth-hacks” that do little to help your bottom line. Suneet Bhatt prompted companies to ask themselves some honest questions that would guide them: What do you want to be? What are your goals? Bhatt pointed out that companies plateau when their goals are not aligned. To make sure you're not pulling down your growth curve, make sure your whole team is on the same page and rallying around a North Star objective to provide value to your customers. 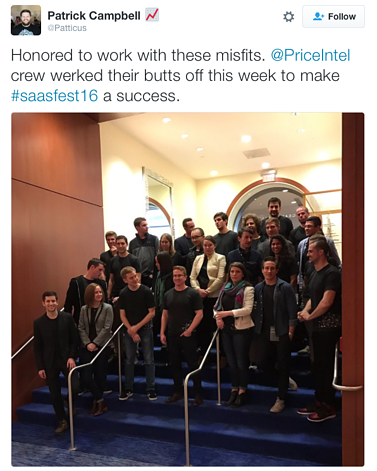 Our second annual SaaSFest was our biggest and best yet, and we aren't stopping here. To make sure that you stay ahead of the SaaS learning curve, stay tuned for updates and early registration for SaaSFest 2017. You're not going to want to miss out on the community, the opportunities to learn, the infamous #saasfest hashtagging, and the many surprises that define SaaSFest. There was so much value in every SaaSFest session—we haven't even scratched the surface here. Keep an eye on the Price Intelligently blog, because we'll be sharing videos of our speakers and more summaries of their incredibly informative—not to mention entertaining— talks. As always, we'll also be sharing our own SaaS insights and pricing strategy secrets for our Price Intelligently community. Stay hungry, stay motivated, and keep up the amazing work in the SaaS world. We're excited to be learning together.